Background: Mucus plugging of the airways is invariably seen in cases of fatal asthma, mucus production is associated with asthma attacks, and the area of submucosal glands is increased in asthma. Mediators secreted from mast cells and neutrophils can stimulate mucous gland secretion. A study was undertaken to count the mast cells and neutrophils in submucosal glands and to relate cell numbers to the presence of mucus in the airway lumen. Methods: Cartilaginous airways obtained at necropsy from cases of fatal asthma (n=8), non-fatal asthma (n=8), and control cases (n=8) were examined. Contiguous transverse sections were stained for mast cell tryptase and neutrophil elastase, and with Periodic Acid Schiff solution to identify mucus. Mucous gland area, lumen area, and the percentage of the relaxed lumen area occupied by mucus (mucus occupying ratio, MOR) were measured. Mast cells (intact and degranulated) and neutrophils per area of submucosal gland were calculated. Results: Compared with controls, the cases of fatal asthma had increased mucous gland area, MOR, percentage of degranulated mast cells, and numbers of neutrophils in the submucosal glands (p<0.05). In cases of non-fatal asthma the MOR and the numbers of mast cells and neutrophils in the submucosal glands were increased (p<0.05). When all cases were pooled together, the MOR correlated with the total number of mast cells (r=0.55, p=0.005) and with the number of degranulated mast cells in the submucosal glands (r=0.51, p=0.013), but not with the number of neutrophils (r=0.21, p=0.121). Conclusion: These results show that mucous gland area, MOR, and mucous gland inflammation are increased in asthma and that degranulation of mast cells may contribute to secretion of mucus into the lumen in cases of fatal asthma. Widespread plugging of the airway lumen with mucus is invariably observed at necropsy in cases of fatal asthma.1–6 The area and number of goblet cells in the airway epithelium are increased in subjects with asthma,2,7–9 and the submucosal mucous glands are increased in area in cases of fatal asthma compared with control cases,10,11 suggesting that enlargement and/or increased activity of these structures may be important in the excessive secretions found in the airway lumen in severe cases of asthma. Aikawa and colleagues9 calculated the mucus occupying ratio (MOR)—that is, the proportion of the cross sectional area of the relaxed airway lumen occupied by mucus—in patients dying of asthma. They found significant increases in the MOR and in the percentage of goblet cells in the epithelium in patients who died of severe acute asthma compared with those who died of asthma after prolonged admission to hospital. They also found that the submucosal mucous gland area as a percentage of the airway wall area was similar in these two groups, and that the MOR correlated with the area of goblet cells within the airway wall epithelium. To our knowledge, there are no previous reports of MOR in mild non-fatal cases of asthma. In a study of cases of fatal asthma the proportion of elastase positive neutrophils in the airway wall and the area of the submucosal mucous glands were significantly greater in patients where the fatal attack was of short duration than in those in whom the fatal attack was longer.16 If increased area of submucosal glands results in increased secretion of mucus, then the sudden stimulation of enlarged glands may account for sudden airway obstruction by mucus. Increased numbers of mast cells and neutrophils present within the submucosal glands may mediate this sudden stimulation. While there is evidence for inflammatory cell infiltration in submucosal mucous glands in patients with chronic bronchitis,17,18 there are no quantitative data on the numbers of inflammatory cells in submucosal mucous glands in mild or severe asthma or of mucus secretion in patients with mild asthma. This study examined the relationship between mast cells and neutrophils within submucosal glands, and the size of the glands and the amount of mucus in the airway lumen in patients with and without asthma. Tissue was collected from individuals who underwent a coroner’s necropsy within the metropolitan area of Perth, Western Australia if the cause of death was asthma or if death occurred suddenly without chest trauma or illness (other than asthma). Information regarding history of asthma, asthma symptoms, use of asthma medications, smoking, time from work or school due to asthma, hospitalisation due to asthma, and measurements of lung function (where available) were obtained from next of kin, hospital files, coroner’s files, and the subjects’ usual medical practitioner. From the information obtained, cases were categorised as (1) controls: no history of asthma, wheeze, use of asthma medications, or other lung disease; (2) non-fatal asthma: died suddenly of non-respiratory causes but subsequently found to have a history of doctor-diagnosed asthma from relatives, usual medical practitioner, or hospital files; (3) fatal asthma: where asthma was given as the cause of death at necropsy, where the report of events before death were consistent with asthma, where cardiovascular and cerebral causes were excluded as a cause of death, and where a history of asthma (as above) was obtained from relatives, medical practitioner, or hospital files. Cases were excluded from the study if details of their medical history could not be obtained. Either the left or right lung was fixed by a combination of immersion and inflation via the main bronchi and the main pulmonary vessels with 10% buffered formalin for at least 48 hours. Initially, all the large conducting airways that could be identified macroscopically down to the subsegmental level, and were accessible and free from branching, had 1 cm long transverse sections cut and embedded into paraffin. This resulted in 12–18 large cartilaginous airway sections with a basement membrane perimeter of >6 mm (diameter >2 mm) per case. From these airway sections, five were randomly selected for this study regardless of whether or not they had a mucous plug that was visible on macroscopic examination. From each airway, four contiguous transverse sections 5 μm in thickness were cut and placed onto silanated slides and stained with haematoxylin and eosin (H&E) for morphological assessment and Periodic Acid Schiff (PAS) for mucous and serous cell content. The remaining two sections were stained using the immunoperoxidase technique with monoclonal antibodies against neutrophil elastase (NP57) and mast cell tryptase (AA1) (Dako Patts, Copenhagen) to identify neutrophils and mast cells. Briefly, tissue sections were deparaffinised, endogenous peroxidase activity was blocked, non-specific attachment of primary antiserum was prevented by pretreatment with 5% normal swine serum, and the primary antiserum (anti-tryptase or anti-neutrophil elastase) was applied. The sections were then incubated with biotinylated (goat) anti-mouse IgG (Silenus Labs, Hawthorn, Victoria, Australia) and incubated with streptavidin-peroxidase complex (Silenus). Peroxidase activity was developed using 3,3-diaminobenzidine tetrahydrochloride (DAB, Sigma) in 30% hydrogen peroxide and then counterstained with Gill’s haematoxylin and mounted in DEPEX. Using a light microscope, camera lucida and digitising tablet connected to a mini computer, measurements were made on airways cut in transverse section, defined by an even thickness of mucosa and submucosa and a short/long diameter ratio of <1:3. The area (Abm) and perimeter (Pbm) defined by the basement membrane was measured and Pbm was used to define airway size. The area of submucosal mucous glands was measured directly with the digitiser and normalised for airway size by dividing the area of glands by the basement membrane perimeter. In tissue sections stained with antineutrophil elastase and mast cell tryptase, neutrophils and mast cells were counted if they were within the area defined and measured as submucosal mucous glands. Positively stained cells were counted if they were found within mucus and serous acini or within the connective tissue stroma supporting the glands. The numbers of positively stained mast cells and neutrophils were expressed as cells per mm2 of the gland area measured previously by digitiser. 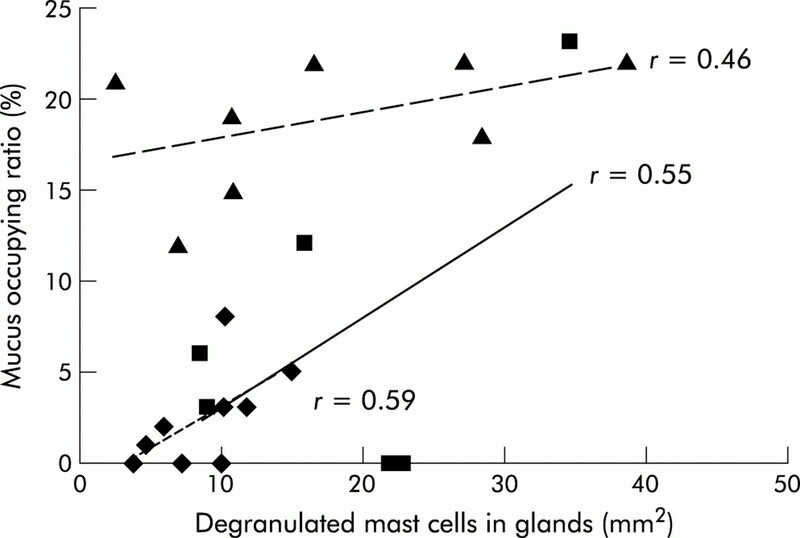 Because mast cells but not neutrophils appeared often to be either partially or completely degranulated, we also made quantitative measurements of mast cell degranulation. The amount of mast cell degranulation was assessed by counting all discrete areas of mast cell tryptase staining in which a nucleus was present. 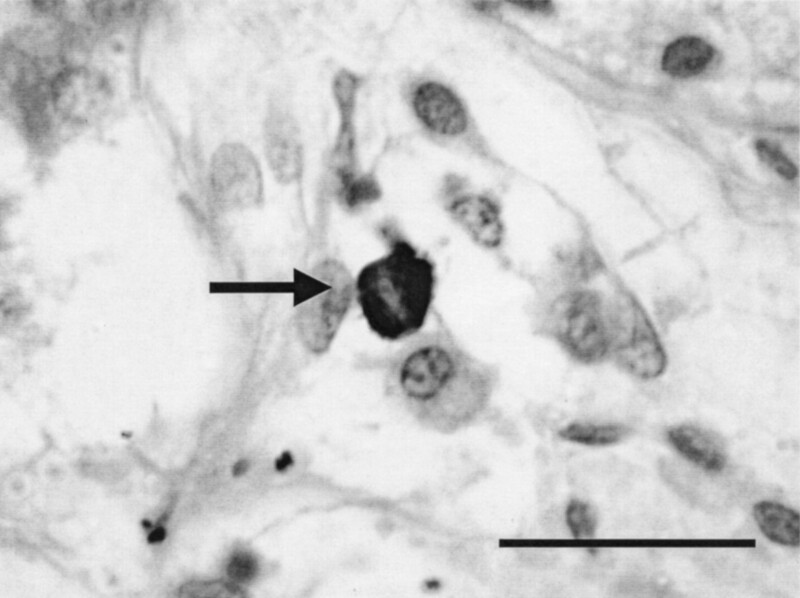 Mast cells seen under high power (×400) were classified as intact if they were dense, compact, with unbroken cytoplasmic boundaries and no surrounding positively stained granules (fig 1). 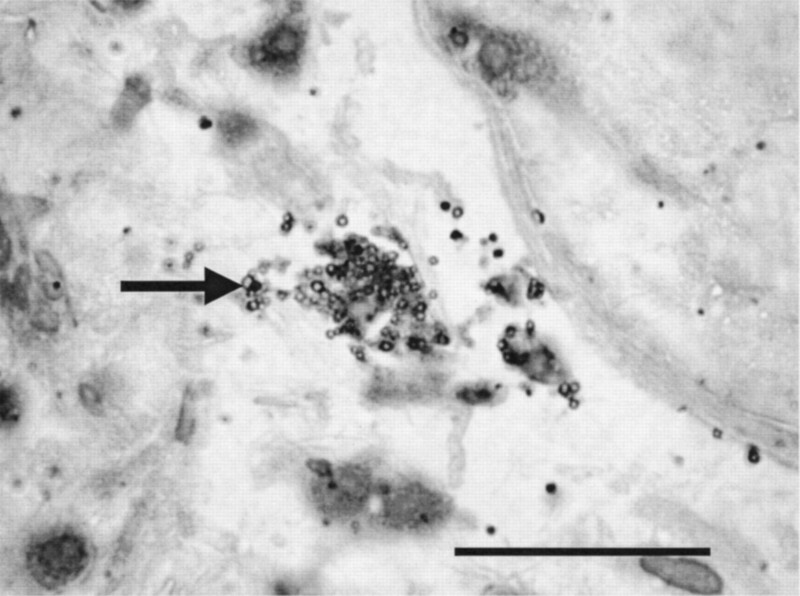 All other mast cells were classified as degranulated (fig 2). The number of intact cells was expressed as a percentage of the total number of positively stained cells. The percentage of degranulated cells was assessed in two ways. Firstly, in two airways from each case 10 random high powered fields around the airway perimeter were chosen so that one border of the high powered field abutted the epithelial surface. All cells falling within that high powered field, regardless of which airway compartment they fell into, were counted. Secondly, to examine the degree to which degranulation of mast cells was affected by which airway wall compartment it was in, the percentage degranulation was calculated for all mast cells across the airway wall, assessed separately for each compartment (epithelium, inner airway wall, airway smooth muscle, outer airway wall, and submucosal glands). High powered photomicrograph of a submucosal mucous gland from a non-asthmatic subject stained with AA1 and counterstained with haematoxylin showing a tryptase positive mast cell (arrow) in which the staining of the individual cell is dense and uniform without obvious signs of free granules. These cells were counted as intact mast cells. Magnification ×1000, bar = 50 μm. High powered photomicrograph of a submucosal mucous gland from a case of fatal asthma stained with AA1 and counterstained with haematoxylin showing a tryptase positive mast cell (arrow) in which the cytoplasmic staining of the individual cell is irregular, non-uniform, with evidence of extracellular granules. Note the difference in the staining intensity compared with the mast cell depicted in fig 1. These cells were counted as degranulated mast cells. Magnification ×1000, bar = 50 μm. Interobserver error was calculated by repeating the same measurements (airway dimensions, cell counts, and degranulation index) from one airway each from two cases of fatal and non-fatal asthma and controls on five separate occasions. The coefficient of variation (standard deviation/mean × 100) was calculated and used to express intraobserver error. All measurements were made with the observer blinded to the cases histories. Measurements of mucous gland area were divided by the basement membrane perimeter and expressed as mm2/mm Pbm. For all measurements undertaken, the mean (SE) value for each case in each airway size group was used for statistical analysis. For measurements of mucous gland area, MOR, neutrophil and mast cell counts, any differences between groups were tested using a one way analysis of variance (ANOVA). Regression analysis and correlation matrices were used to examine the relationship between cell numbers and MOR, cell numbers and submucosal gland area, and between MOR and submucosal gland area. A probability value of less than 5% was considered significant. The cases of fatal asthma were generally severe, requiring oral and inhaled steroids and frequent bronchodilator use. With the exception of one case, they all had long histories of asthma, frequent symptoms, had previously been hospitalised or had time off work or school because of their asthma, and had measurable airflow obstruction (table 1). The cases of non-fatal asthma were generally mild with no patients using oral corticosteroids and only two requiring inhaled corticosteroids. Lung function data were available for all cases of fatal asthma, two cases of non-fatal asthma, and no lung function data were available for the control group. Forty cartilaginous airways from eight cases of fatal asthma, 40 from eight cases of non-fatal asthma, and 39 from eight control cases were examined (one airway section was badly damaged and unusable). Mean (SE) airway sizes measured by Pbm were similar in cases of fatal asthma (15.5 (1.4) mm), non-fatal asthma (16.1 (1.6) mm), and controls (15.9 (1.6) mm). The cases of fatal asthma had significantly increased mucous gland area and MOR compared with cases of non-fatal asthma and controls (gland area (mm2/mm Pbm) fatal asthma: 0.2 (0.02), non-fatal asthma: 0.13 (0.02), controls 0.12 (0.02), p<0.05; MOR (%) fatal asthma: 28.2 (8.1), non-fatal asthma 12.0 (3.3), controls 3.2 (0.5), p<0.05). Cases of non-fatal asthma had increased MOR compared with control cases (p<0.05), but the area of mucous glands was not significantly different between the two groups. All mast cells and neutrophils were seen within the supporting stromal tissue surrounding glands. No cells were noted within individual serous or mucous acini. There was marked degranulation of mast cells (fig 2) but not neutrophils within the mucous glands in cases of asthma, a finding supported by the finding that the mean (SE) percentage of intact mast cells within the submucosal mucous gland compartment was significantly lower (p<0.05) in cases of fatal asthma (10 (5)%) and non-fatal asthma (16 (6)%) than in controls (55 (9)%). By comparison, the percentage of intact mast cells across the whole airway wall in large airways was 23 (5)% in cases of fatal asthma, 34 (6)% in cases of non-fatal asthma, and 58 (4)% in controls. The percentage of intact mast cells in the mucous glands was significantly lower than the total percentage of intact mast cells across the whole airway wall only in cases of asthma. The number of neutrophils within mucous glands was higher in cases of fatal asthma than in controls, while cases of non-fatal asthma had increased numbers of both mast cells and neutrophils within mucous glands compared with controls (table 2). 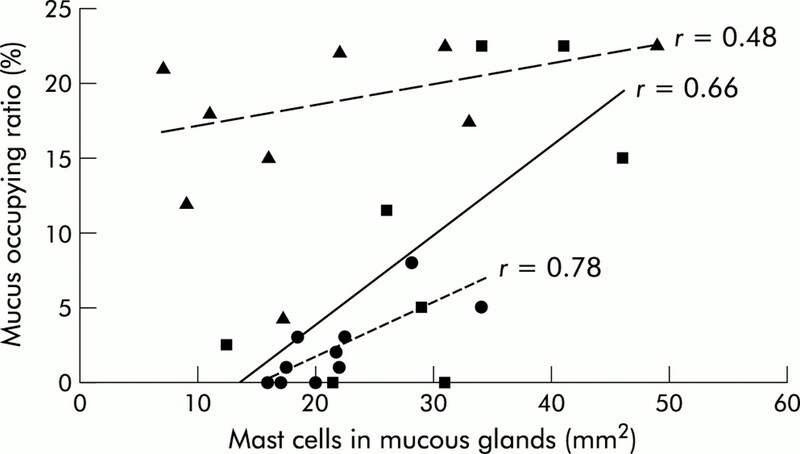 When all cases were pooled together, the MOR correlated with the density of total mast cells (intact and degranulated) within mucous glands (r=0.55, p=0.005; fig 3), degranulated mast cells within mucous glands (r=0.51, p=0.013; fig 4), but not with neutrophils (r=0.21, p=0.121). Correlation between the density of total numbers of mast cells (intact and degranulated) within submucosal mucous glands and the mucus occupying ratio (MOR) in cases of fatal asthma (triangles), non-fatal asthma (squares), and controls (circles). Individual case group correlations are also shown. When all cases were pooled together r=0.55, p=0.005. Correlation between the density of degranulated mast cells within submucosal mucous glands and the mucus occupying ratio (MOR) in cases of fatal asthma (triangles), non-fatal asthma (squares), and controls (circles). Individual case group correlations are also shown. When all cases were pooled together r=0.51, p=0.013. The coefficient of variation for intraobserver error on airway dimensions was 3%, 11% for cell counts, and 10% for the degranulation index. Mucous gland area corrected for airway size in cases of fatal asthma and MOR in cases of fatal and non-fatal asthma were increased compared with control cases. The density of mast cells within submucosal mucous glands was higher in cases of non-fatal asthma than in cases of fatal asthma and controls and the density of neutrophils within submucosal mucous glands was increased in both fatal and non-fatal asthma compared with controls. The proportion of mast cells within the glands was significantly higher than the proportion of neutrophils within the glands. Mast cells but not neutrophils within glands and across the whole airway wall were degranulated in cases of asthma. The percentage of degranulated mast cells was greater in the mucous glands of asthma cases than across the whole airway wall. There was a significant correlation between mast cell numbers (total and degranulated) within submucosal glands and the extent of mucus plugging of the airway lumen (MOR). The methods used to quantitate mast cell density in this study are similar to those used in other studies cited here—that is, expressing the number of cells counted within a defined two dimensional area measured in mm2. This method of estimating cell numbers can be considered a profile count of cells within a three dimensional structure that may be subject to bias if certain conditions are not met. Firstly, sampling of tissues and fields of interest for measurements need to be performed in a systematic random fashion. Secondly, cell counts may be biased unless all cells of interest have an equal probability of being counted. This depends largely on cell size, orientation, and thickness of tissue section. Thirdly, the reference area for measurements—that is, a two dimensional profile area—should be related to the three dimensional volume that the profile represents. In this study the sampling processes, from lung collection to individual airway blocks and sections, were systematic and random. The size of the mast cell is relatively uniform and small compared with the reference area in which they were measured. We only examined nucleated cells in single 5 μm tissue sections which were obtained from different branches and levels of the bronchial tree. Since we were unable to define an initial reference volume for the whole lung, we cannot convert our two dimensional profile counts into a three dimensional volume estimate of absolute cell numbers. Thus, we cannot assess the degree to which the volume of the reference space may be varying in this study. To overcome this variability, we examined a large number of randomly selected airways from different sites in the lung and used the mean data from each case to compare cell numbers between groups. We feel that comparisons of relative cell densities between our groups are valid and make our data directly comparable with the many other published studies that have counted cells in this way. Mast cell tryptase rather than chymase was used to identify mast cells so that we could identify all mast cells which contained granules. Chymase is present in only 15–45% of mast cells within the lung27 but is also a very potent secretagogue.15 Increased numbers of mast cells and neutrophils in and around the submucosal mucous glands in cases of asthma could result in increased amounts of chymase, tryptase, elastase, and cathepsin G being secreted, relative to non-asthmatic cases, when these cells are stimulated. These mediators are well described as potent stimuli for secretory cells in the airway. The numbers of mast cells within the glands (23–40 cells/mm2) were much greater than the numbers of neutrophils within the glands (3–4 cells/mm2). This may explain, at least in part, why there was a weak correlation between mast cell numbers but not neutrophils within the mucous glands and the amount of mucus in the airway lumen. Even when stimulated, the low numbers of neutrophils within the mucous glands may not be enough to result in excessive secretion of mucus. The correlation between mast cell numbers but not neutrophils in the glands and MOR and increased degranulation of mast cells suggests that mast cells, rather than neutrophils, are the predominant effector inflammatory cell in the mucous glands. It is possible that the increased numbers of neutrophils seen within the mucous glands in asthma in this study may be present because of other factors such as cigarette smoking or infection. Interestingly, in this study the cases of non-fatal (mild) asthma had significantly more mucus in the airway lumen than the control cases. While the presence of extensive tenacious mucus plugs in the airway lumen is well documented in cases of fatal asthma,1–6 the role of mucus in the airway lumen in the pathogenesis of mild asthma is not clear. The cases of non-fatal asthma in this study could be considered mild in terms of asthma symptoms, which occurred infrequently with most cases only requiring an inhaled β agonist to control their asthma. We did not have information which allowed us to ascertain whether these cases were symptomatic or not at the time of their death. Even so, the presence of mucus in the airway lumen in these cases suggests that mucus accumulation can occur even in mild cases of asthma. Lumenal mucus may therefore play an important role in excessive airway narrowing in cases of mild as well as severe asthma. The area of submucosal mucous glands was not increased in the cases of non-fatal asthma compared with controls, which suggests that increased secretory rate (possibly due to increased airway mast cells) still occurs even in mild cases. Other mechanisms causing the increased MOR seen in the cases of asthma cannot be excluded. Cholinergic stimulation of submucosal glands and secretions from goblet cells in the airway epithelium might also be responsible for increased amounts of mucus in the airway lumen. Aikawa and colleagues9 have shown that goblet cells are an important source of mucus in the airways in cases of fatal asthma, although this finding appeared to be more important in the peripheral airways where there are no submucosal glands. There was a large amount of epithelial damage and desquamation in all the cases examined at necropsy in this study, so we made a conscious decision to exclude an analysis of goblet cells because we could not be sure how representative the remaining intact epithelium was in terms of goblet cell density and cellular infiltrate. However, it is worth mentioning that goblet cells were often prominent in cases of non-fatal and fatal asthma but not in control cases, and we cannot preclude that they may have also contributed significantly to MOR. In addition, it is possible that instillation of fixative into the main bronchus may have washed away some lumenal mucus during processing. However, if this was the case, we feel that we may be underestimating the amount of mucus present in the airway lumen and that the correlation between mucus and mast cells in the glands might be improved if this had not occurred. Nevertheless, we still found significant changes in the MOR between case groups and a correlation between MOR and mast cells in the submucosal mucous glands. This study has shown a relationship between airway inflammation and mucus plugging and severity of asthma. It suggests that mast cell degranulation, rather than neutrophil degranulation, is related to mucus secretion. Increased mast cell degranulation and increased mucous gland area will both contribute to the rapid secretion of increased amounts of mucus in cases of asthma. Lumenal mucus may be important in mild as well as severe asthma. It will be important to establish whether current treatment regimes, which may act predominantly on eosinophilic inflammation in the inner airway wall, are effective in reducing mucous gland inflammation and whether this reduction will lead to reduced secretion of mucus from glands into the airway lumen. Huber HL, Koessler KK. The pathology of bronchial asthma. Arch Intern Med1922;30:689–760. Messer JW, Peters GA, Bennett WA. Causes of death and pathologic findings in 304 cases of bronchial asthma. Dis Chest1960;38:616–24. Dunnill MS. The pathology of asthma with special reference to changes in the bronchial mucosa. J Clin Pathol1960;13:27–33. Houston JC, De Navasquez S, Trounce JR. A clinical and pathological study of fatal cases of status asthmaticus. Histopathology1953;2:407–21. Bullen SS. Correlation of clinical and autopsy findings in 176 cases of asthma. J Allergy1952;23:193–203. Unger L. Pathology of bronchial asthma, with five autopsy reports. Southern Med J1945;38:513–23. Glynn AA, Michaels L. Bronchial biopsy in chronic bronchitis and asthma. Thorax1960;15:142–53. Salvato G. Some histological changes in chronic bronchitis and asthma. Thorax1968;23:168–72. Aikawa T, Shimura S, Sasaki H, et al. Marked goblet cell hyperplasia with mucus accumulation in the airways of patients who died of severe acute asthma attack. Chest1992;101:916–21. Dunnill MS, Massarella GR, Anderson JA. A comparison of the quantitative anatomy of the bronchi in normal subjects, in status asthmaticus, in chronic bronchitis, and in emphysema. Thorax1969;24:176–9. Carroll NG, Elliot J, Morton AR, et al. The structure of large and small airways in nonfatal and fatal asthma. Am Rev Respir Dis1993;147:405–10. Saetta M, Di Stefano AD, Rosina C, et al. Quantitative structural analysis of peripheral airways and arteries in sudden fatal asthma. Am Rev Respir Dis1991;143:138–43. James AL, Pare PD, Hogg JC. The mechanics of airway narrowing in asthma. Am Rev Respir Dis1989;139:242–6. James AL, Carroll NG. The theoretical effects of mucous gland discharge on airway resistance in asthma. Chest1995;107:110s. Nadel JA. Role of mast cell and neutrophil proteases in airway secretion. Am Rev Respir Dis1991;144:S48–51. Carroll NG, Carello S, Cooke C, et al. Airway structure and inflammatory cells in fatal attacks of asthma. Eur Respir J1996;9:709–15. Pesci A, Rossi GA, Bertorelli G, et al. Mast cells in the airway lumen and bronchial mucosa of patients with chronic bronchitis. Am J Respir Crit Care Med1994;149:1311–6. Mullen JBM, Wright JL, Wiggs BR, et al. Reassessment of inflammation of airways in chronic bronchitis. BMJ1985;291:1235–9. Connell JT. Asthmatic deaths: role of the mast cell. JAMA1971;215:769–72. Hunt LW, Gleich JH, Butterfield JH. Mast cells in fatal asthma: Visualization with an immunofluorescent stain to mast cell tryptase. Am Rev Respir Dis1991;143:A41. Trigg CJ, Manolitsas ND, Wang J, et al. Placebo-controlled immunopathologic study of four months of inhaled corticosteroids in asthma. Am J Respir Crit Care Med1994;150:17–22. Sousa AR, Poston RN, Lane SJ, et al. Detection of GM-CSF in asthmatic bronchial epithelium and decrease by inhaled corticosteroids. Am Rev Respir Dis1993;147:1557–61. Djukanovic R, Wilson JW, Britten KM, et al. The effect of beclomethasone dipropionate treatment on clinical indices of asthma and inflammatory cells in the asthmatic airways. Eur Respir J1990;3:237s. Jeffery PK, Godfrey RW, Adelroth E, et al. Effects of treatment on airway inflammation and thickening of basement membrane reticular collagen in asthma. A quantitative light and electron microscopic study. Am Rev Respir Dis1992;145:890–9. Gibson PG, Wong BJ, Hepperle MJ, et al. A research method to induce and examine a mild exacerbation of asthma by withdrawal of inhaled corticosteroid. Clin Exp Allergy1992;22:525–32. Carroll NG, Cooke C, James AL. The distribution of eosinophils and lymphocytes in the large and small airways of asthmatics. Eur Respir J1997;10:292–300. Berger P, Walls AF, Marthan R, et al. Immunoglobulin E-induced passive sensitisation of human airways: an immunohistochemical study. Am J Respir Crit Care Med1998;157:610–16. Ammit AJ, Bekir SS, Johnson PRA, et al. Mast cell numbers are increased in the smooth muscle of human sensitized isolated bronchi. Am J Respir Crit Care Med1997;155:1123–9. Carroll NG, Mutavdzic S, James AL. Mast cells and neutrophils in the airway wall in asthma. Am J Respir Crit Care Med1998;157:A872. Djukanovic R, Wilson JW, Britten K, et al. Effect of an inhaled corticosteroid on airway inflammation and symptoms in asthma. Am Rev Respir Dis1992;145:669–74. Bentley AM, Hamid Q, Robinson DS, et al. Prednisolone treatment in asthma: reduction in the numbers of eosinophils, T cells, tryptase-only positive mast cells, and modulation of IL-4, IL-5, and interferon-gamma cytokine gene expression within the bronchial mucosa. Am J Respir Crit Care Med1996;153:551–6. Supported by Asthma Foundation of Western Australia, NH&MRC Australia.